Flash Donation - This is Awesome. 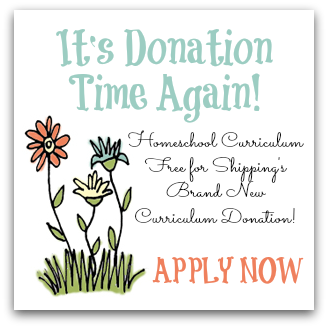 A donor has contacted me privately to offer something very special to one homeschool family who needs it. Sorry! This donation is now closed! Watch the sidebar to the right and sign up for emails from the blog so you won't miss the next one! This donation is only going to be offered through this Friday, December 19th. It's also a really nice gift - one that would receive probably hundreds of requests if posted through the Facebook group, so she wishes for the leadership team and I to help her find someone and save her the difficult task. We're glad to help! Here's the form, and good luck! (Helpful tip: these forms don't always work well on phones or other handheld devices - best to apply via computer).